You need to know about traffic laws abroad if you plan to rent a car. Those are the kinds of traffic laws abroad that you need to be aware of. ...and that could get you lost or confused. ...THAT could get you a ticket. The best way to find out about the rules of the road in the country you are going to visit is to go to government websites. Look for travel information on road conditions and laws for each country you plan to drive in. When you get to the rental car counter, ask if there are any rules that might be different from home. The car rental agents won't be able to give you all the answers, but they can answer basic questions. That's a rule you need to observe everywhere, but the legal tolerances for blood alcohol level vary around the world. And more and more countries are going to zero tolerance of any drinking and driving. Want to find out more? Wikipedia has a whole page on blood alcohol content and what the limits of each country are. 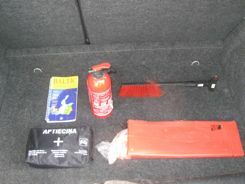 Some traffic laws abroad apply to safety equipment that should be carried in the trunk (or boot) of the car. The rental car companies should provide anything that is required, but you should know about the laws. Many countries require orange or yellow "visibility" vests. Some countries say these should be inside the car, so that you can have them on anytime you exit the car on the side of the road. Some say you can have them in the trunk. Sometimes only one vest is required, sometimes more. 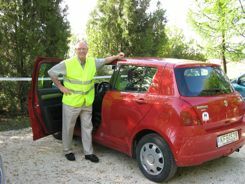 To go along with those vests, many of the same countries require that the car has a reflective triangle to alert other drivers if you have to park on the side of the road. First aid kits are compulsory to carry in some countries and highly recommended in others. Sometimes you're supposed to carry replacement headlight bulbs. Do You Need Spare Glasses? In some countries, drivers who wear eyeglasses must carry a spare pair in the car at all times. What's A Foreign Driver To Do? Well, for equipment, the rental car should have what is required... but you should check to make sure that it does. We always even check for the spare tire! Most countries now want headlights on when the windshield wipers are on. Some countries want headlights on during the winter. 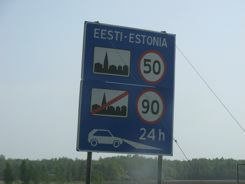 If you're driving across a border, look for informational signs that will tell you the basic speed limits and rules. Or turn left on a red light if you're driving on the left? That's another law that varies by country. We say, when in doubt, wait for a green light. In Germany, you may be able to park and leave a blue plastic disk showing when you stopped... those will generally be in the rental car. In France, some meters need to be swiped with a card that you get at newsstands or "tobacconists". 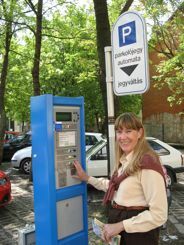 In most cities, you need to find a parking garage or a machine on the street where you can buy a "pay and display" ticket. Sometimes you even get to park for free! You need to be aware of which countries require toll sticker (or vignettes) to be on the car for using the highways. Are you supposed to flash your headlights when passing, or are you never supposed to flash them? Will you get a ticket if you DON'T use your signal while passing... that could happen in Spain. Is honking the horn illegal in the town you're driving through? OK... We know we're not giving you answers here. The traffic laws abroad vary too much for us to do that. We're asking the questions that you should think about.